Passionately Urban - Happy Leap Year! Post details: Happy Leap Year! Today is a gift...we get an extra day in the year. I've been super busy lately and I feel like I need all of the extra time I can get. Thank God for Leap Year! As a little Leap Year treat, I thought I'd post a couple of rare pictures. 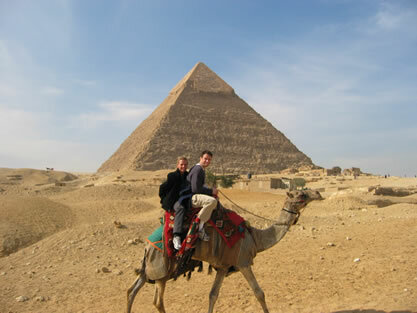 This is Chris and me riding a camel in Egypt last month...My legs hurt for a couple of days after this. Our camel's name was Manny. That's the Great Pyramid of Giza (AKA Pyramid of Khufu) in the background. This was amazing to see and view as I have never seen anything this old. This is one of the 7 wonders of the Ancient World and there are three large pyramids (for 3 kings) here, with smaller pyramids (for the kings' wives), and several other tombs for all of the servants and other important people in the kings' daily lives. The Pyramids of Giza are located just outside of Cairo and were constructed over a 20 year period concluding around 2560 BC. 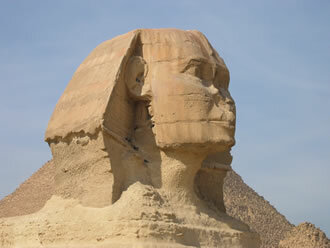 Here's a picture of the Guardian's Sphinx, which has the body of a lion and head of a king or god. 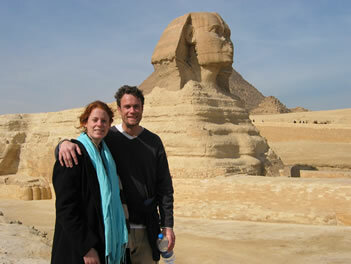 The sphinx is known to symbolize strength and wisdom. The most popular and current theory of the builder of the Sphinx holds that it was commissioned by the 4th Dynasty King, Khafre (2558-2532 BC). Khafre was one of the sons of Khufu (AKA Cheops). The Sphinx lines up with the Pyramid of Khafre at the foot of its causeway. This camel below isn't the same camel as the one above, but he sure was thirsty. 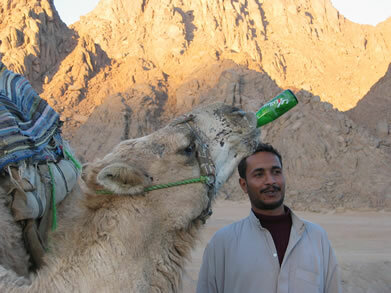 This was the day we rode ATVs through the Sinai desert and shared a cup of tea with the Bedouins (AKA Egyptian Nomads). I think that this would make a great advertisement for 7UP. I haven't passed it on to the execs yet. Some day you should check out Egypt and all of the awesome history there. 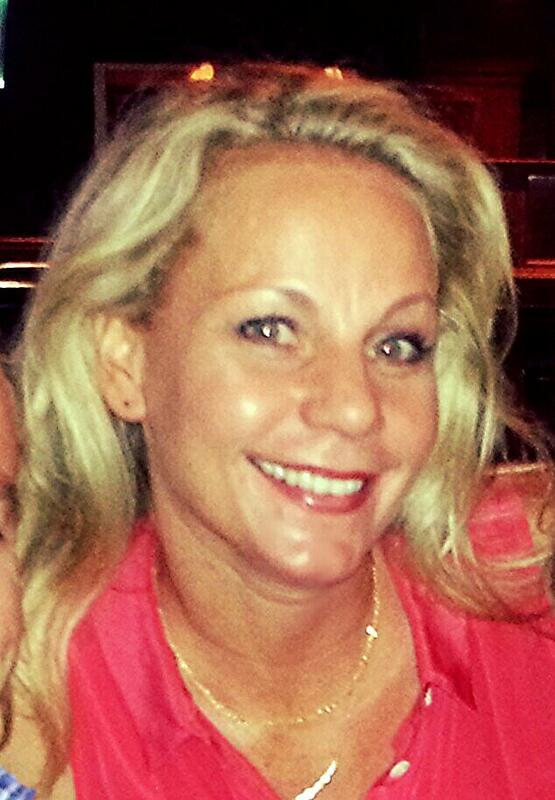 It was an eye-opening and very enlightening experience for me. Enjoy the free day!